Every once in a while, an album arrives just in time to give the people a voice. The Vietnam-era got Marvin Gaye’s What’s Going On in 1971, Gulf War-stricken Generation X had Pearl Jam’s Ten and Rage Against the Machine’s self-titled debut, and Ice Cube held a mirror up to the Los Angeles riots on The Predator in 1992. Amidst a groundswell of tensions and upheavals, D’Angelo and The Vanguard delivered Black Messiah upon unsuspecting, yet receptive masses on December 15, 2014. It not only broke a 14-year studio silence from the Grammy Award-winning multi-platinum singer, songwriter, and producer, but it also reaffirmed the need for raw, righteous, and real soul. Its impact could immediately be felt when it landed at #1 on the Billboard R&B/Hip-Hop Albums Chart and #5 on the Top 200, and eventually earned two Grammy Awards for Best R&B Album and Best R&B Song for “Really Love” in 2016. Black Messiah espouses a timeless ethos that couldn’t be more necessary now. Whispers abounded of an album since his last release, 2000’s seminal Voodoo, and D’Angelo stripped everything down to its core in order to deliver. Faced with the daunting task of assembling a new band – one that had to satisfy D’Angelo’s extremely high musical bar and appeal to fans and critics alike – The Vanguard was assembled. Music director and world-renowned bassist Pino Palladino (The Who, Eric Clapton et.al.) is the only holdover from D’Angelo’s original band the Soultronics. Besides their exciting leader, the Vanguard’s most frequent soloists are its stellar guitarists, the legendary Jesse Johnson and young phenom Isaiah Sharkey. Johnson is best remembered as an original member of The Time and for a string of solo hits under his own name. D’Angelo discovered Chicagoan Isaiah Sharkey in a Virginia music store. He was so captured by the youngster’s mature and diverse stylings that he instantly drafted him for The Vanguard. Veteran drummer Chris “Daddy” Dave was in wide demand before committing to The Vanguard, having toured as an early member of Mint Condition and with a wide variety of artists including jazz saxophonist Kenny Garrett. Keyboardist Cleo “Pookie” Sample is another young talent D’Angelo recruited from Houston, Texas, where Sample could be seen playing everything from jazz to Gospel. The Vanguard vocalists are Kendra Foster, Charlie “Red” Middleton and Jermain Holmes. Middleton and Holmes grew up singing together in church while the multi-talented Ms. Foster was a long time member of George Clinton’s P-Funk and grew into a first rate collaborator with her distinctive writing for Black Messiah. Abiding by a strict no digital plug-ins rule, opting to cut the 12 tracks on analog tape and primarily vintage instruments and amplifiers, the resulting musical journey captivates at every turn. “Ain’t That Easy” ignites the ride with a funky guitar stomp and towering falsetto just before “1000 Deaths.” The wah-ed out intro and sample chills just before the singer ominously intones, “I can’t believe I can’t get over my fear.” The tempered percussion of “Back to the Future (Part 1)” fans a Motown flame as the lyrics paint an elegantly thoughtful portrait. “Till It’s Done (Tutu)” sees him carry a delicately infectious chorus, and the closer “Another Life” ends with a heavenly crescendo of pianos, guitar, and harmonies. 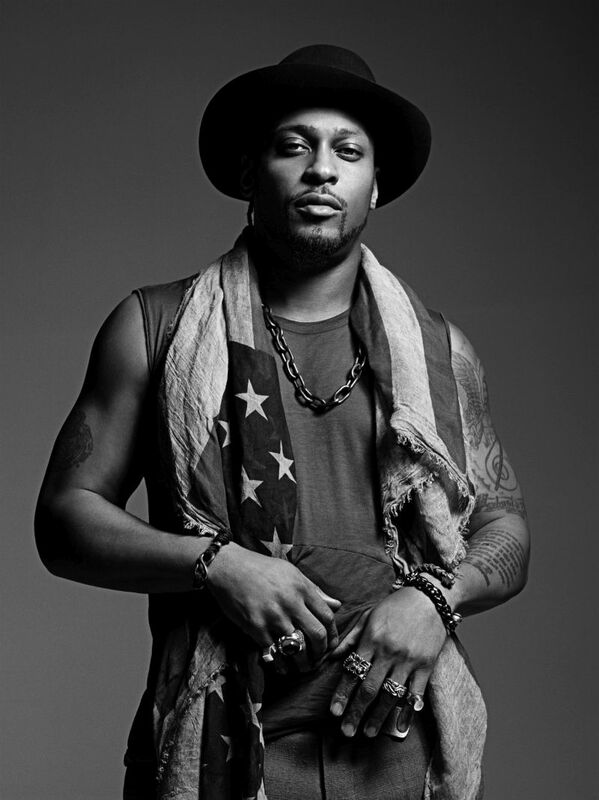 Black Messiah continues a series of genre-bending traditions for D’Angelo. His 1995 debut, Brown Sugar, breathed new life into R&B and yielded gems including the title track, “Lady,” “Cruisin’,” and more. Its follow-up, Voodoo, received a Grammy Award for “Best R&B Album,” while the single “Untitled (How Does It Feel)” earned the Grammy for Best Male R&B Vocal Performance. D’Angelo redefines music once more with Black Messiah though. That feeling is going to live on for a long time to come, a vanguard for a new generation.